Gene Black an Alabama Artist and Quilter: A Finish!!!! Yes! It is completed. With any luck, it will be shipped today. What is it you ask? 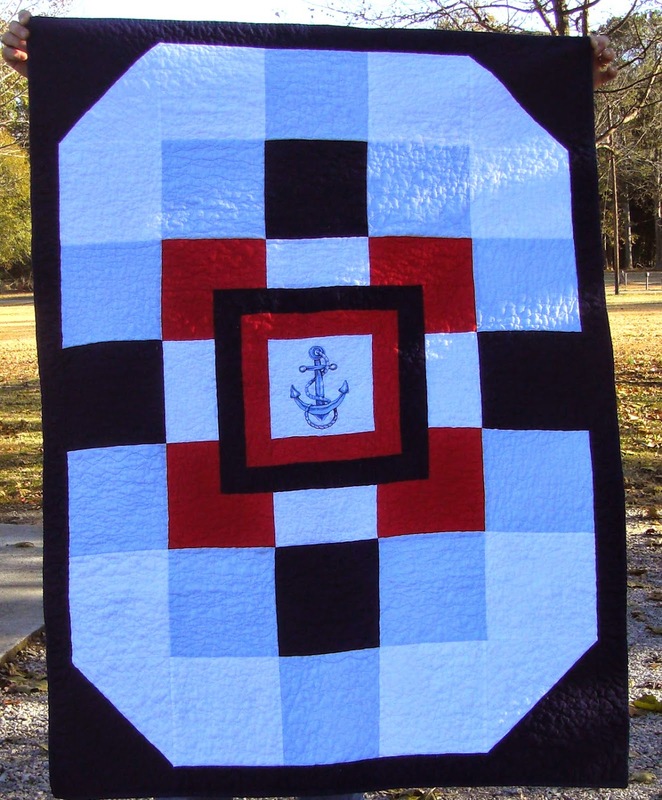 The Anchor Baby quilt is all quilted, bound and ready to go. I washed and dried it yesterday as is my practice. I try to never let a quilt leave my hands without being washed. Any surprises should happen to ME not the recipient. By surprises, I mean: Burst seams (hey it happens) - Color bleeding -or any other "oh no! what happened!" moment. I was quite pleased with the final result. The quilt is lovely and did the perfect quilt puffy wrinkle that makes it so snuggly. Just look! The sun shining across the surface really shows off the effect. Of course, I know you want to see the entire quilt, so here it is. I hope it is loved by the recipient as much as I love it. While the quilt was in the wash, I took one of the work logo shirts that I had purchased but could no longer wear since retirement and "fixed" it. I put some of my handwoven fabric and a backing layer of white cotton behind the logo. It was all held nicely in place with some Lapel Stick. I sewed with a triple stitch and then carefully cut the original logo area away just inside that stitch. 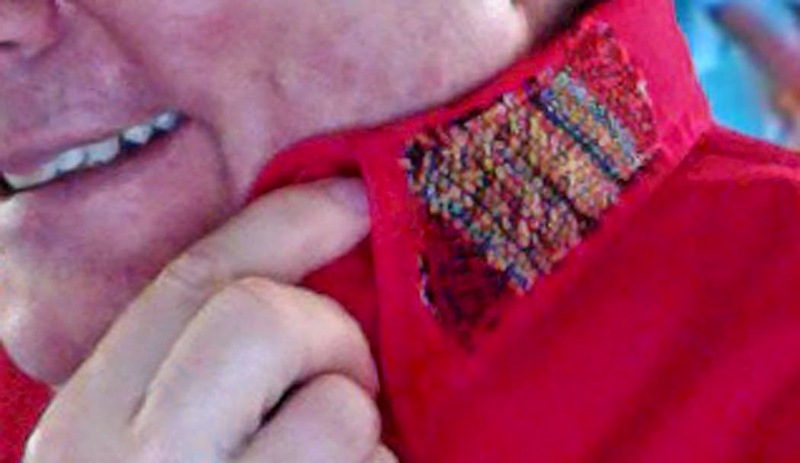 Since the cotton shirt just might fray, I also zigzagged over the edges with a matching red thread. Then I wanted to add a bit more interest to the shirt so I added a collar bit. For this I just used the triple stitch around it twice. It isn't going anywhere. I also added a bit on the center back yoke. But I didn't take a picture of that one. Thanks to everyone who has responded for the Quilt Angels. I will remind everyone that there are tabs at the top of my blog and there is a tab for more information about the Quilt Angel Project. Love the quilt and I know the recipient will too! Great save for the shirt too. Hope that quilt got into the mail today....it is beautiful! I really like how you added the design to your shirt Gene...you're always coming up with something fun to do. The Anchor Quilt turned out great Gene! I'm sure they will love it. Washing and puckering to "cozy" is my choice too. It is wonderful, and I know you are glad it's finished. I love the way you make a second life for things! The quilt is perfect. Quilting is amazing. Looks all ready to cuddle in. Great way to "re-do" your shirt. The added weaving is cool. Love both the shirt and the quilt. The design on the quilt is excellent and the quilting just finished a great piece and made it Super !~! Your quilt turned out wonderfully!!!! Such a bold and striking design for this quilt and you got a nice even texture with your quilting. Congrats on a lovely finish.